Mahou no Ichigo exists to bring you information about the anime and manga world and some of my favorite titles within it…all in one place. Here you will find not only existing titles, but also information on the industry itself, as well as guides to help you get started if you’re interested in the business. In addition, you can also submit your fan-made material, such as fanfiction and fan art, to be posted in the Fandom section. Ever wonder what goes on behind the scenes at a convention, or perhaps how animators get from concept to completion? You’ve come to the right place. Mahou no Ichigo, or “Magical Strawberry,” was originally created to show off fan-made material. Then I began to expand it, making it a much larger, more intricate site with lots of functions. When I began that transition process, I initially intended the site to serve as an anime/manga fan database, allowing extensive perception of the methods and functions of animators, animation and publishing companies, manga artists, seiyuu (voice actors), and authors to be viewed in great depth by fans. The information provided would help aspiring manga artists learn what steps they need to take in order to reach their goals, whether it’s to have their very own manga published or anything else the fun and inspiring world of manga offers; and amateur animators can view tips and tricks to make their animations look more professional. In addition, I planned to continue Mahou no Ichigo’s original purpose of showing off fanworks like fan art, original characters within a fandom, doujinshi, fanfiction, and much more. However, my own lack of experience in the industry and problems with coding discouraged me from working on the site, leading to procrastination and eventual loss of interest. I realized I couldn’t maintain such a large website (or at least the one I was imagining) by myself, especially when there was already such a great wealth of information out there by industry leaders much more experienced than me, and a database of anime and manga that I couldn’t touch with a mimicking site of my own! That is why the website is gone now… But how did it start off? 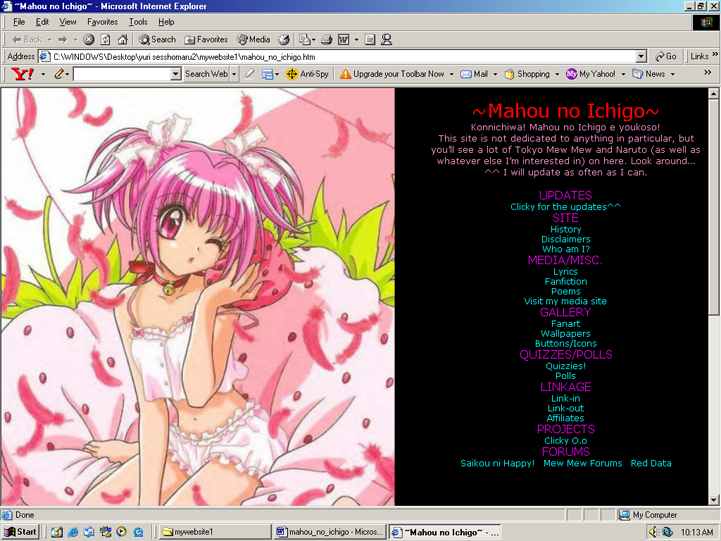 Mahou no Ichigo first started out as nothing more than a fansite. I created it back when I knew nothing about HTML or web hosting or anything related to having your own website, so it was hosted on my computer by use of the widely-known Microsoft Word. One day I came across Yahoo! 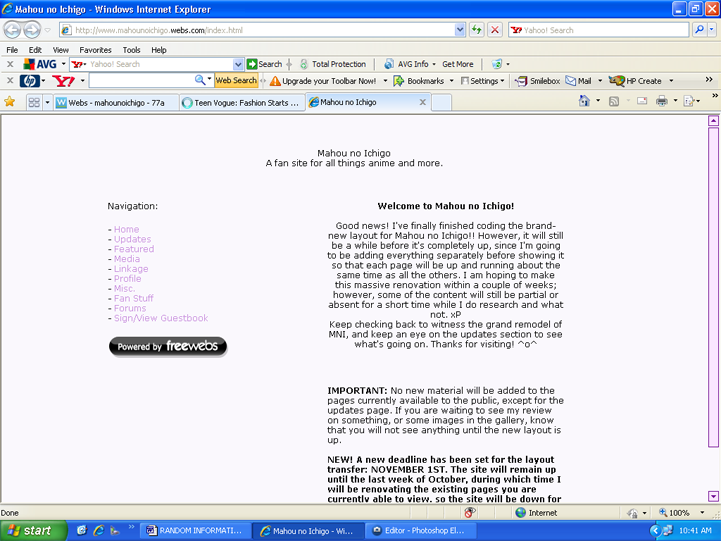 Geocities and signed up for my free account, intending to make MNI my very first website. Unfortunately, some of the pages didn’t come up once they were on Geocities, even though I had converted the Word files to HTML documents. I left it alone for a while until I was browsing Cafe Mew Mew, an in-depth Tokyo Mew Mew fan site, where I found a link to Myuu Town Graphics. I downloaded several of the layouts and ultimately gave MNI a major upgrade. I began making a serious effort to learn basic HTML so that I would at least have an idea of what I was doing when I edited the content in the layouts and what not. But it wasn’t until December of 2008 that I really got serious about transforming MNI into what I thought was its best version yet. It, of course, took a while to make this change. A few months later I updated the layout again and cleaned up the pages. In May I began moving the index to Webs because Geocities was shutting down. I then began designing a new layout, introducing it to the public for the first time in November 2009. Since then, Mahou no Ichigo has been gaining interest in the eyes of many anime and manga fans alike, and I am hoping that people will continue to enjoy it for many years to come. 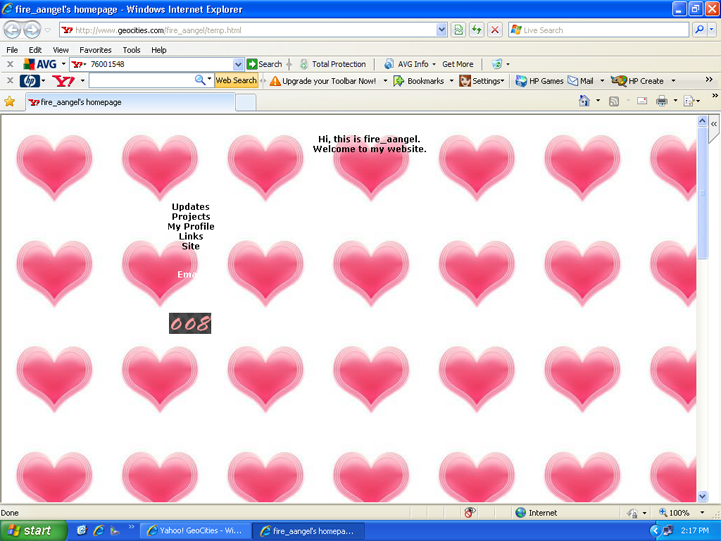 MNI’s first layout was created entirely with Microsoft Word. 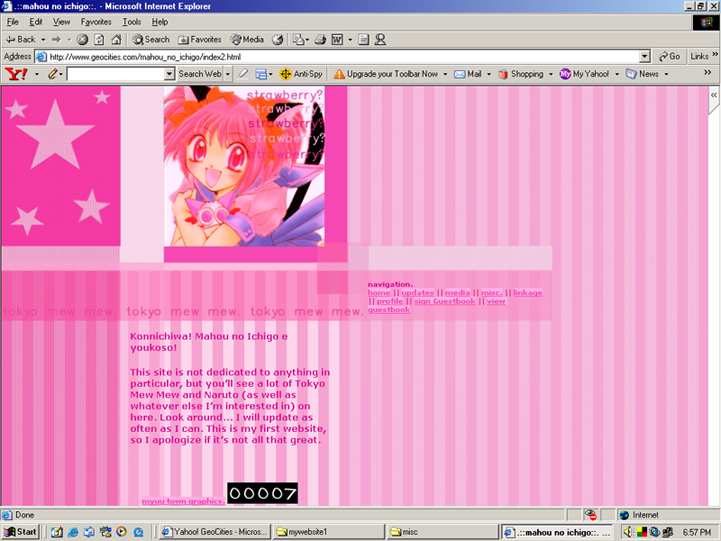 It featured a large picture of Momomiya Ichigo (from Tokyo Mew Mew) on the left, and had a very simple links system. However, there wasn’t really much of a point to the site then, so there wasn’t much content or devotion at that time. The second layout was courtesy of Myuu Town Graphics. I included the intention of adding a lot more content, even going to the extent of making my own icons to add to the site. However, the layout just didn’t fit with the amount of stuff I wanted to put on the site. So I began looking for other ways. After finding the incredible Magitek Designs, I used one of their tutorials to create a very simple, clean layout that had virtually no graphics whatsoever but gave me more room to add content. It was at this point that Geocities, my previous webhost, announced that it was closing, so I had to not only convert the site to the new layout but also transfer it to Webs. I love the look of the layout, but it just wasn’t intriguing enough for MNI’s purpose. Once again, I did close to nothing with the site until I changed the layout again. I had lost focus of what I was trying to develop! This third layout was courtesy of Razzberru (Razz), and it helped to get me back on track with its larger content area and clean design~ But it still wasn’t original enough; I was still using other people’s layouts and it didn’t quite feel like my site. So I went back to tutorials and built my own, from the ground up! The final layout I made entirely myself with a wider content area and a chocolatey color scheme. The only downside was, the layout appeared broken everywhere except Internet Explorer, and I couldn’t ever figure out how to fix it. You can still see this layout active on some pages, such as the journal I wrote while in China. When I first started to try to make icons, my process was simply cropping a picture in Paint and saving it as a new file. But I soon realized that they had no set dimension to them–some were 61×124 and others were 89×67 (in other words, not standard icon sizes). After getting Photoshop I learned how to properly crop images, and then how to determine the correct size the icon should be. I then looked at some tutorials to begin helping me make true icons using textures and special coloring and lighting effects. I first began making graphics in February of 2009. I caught on fairly quickly, since the process isn’t really that hard. (Just look at some tutorials…it’s pretty simple.) Eventually I decided to put my new graphics on my very blank icons/graphics page! At first, before I discovered the “proper” way to make icons and banners, I had my icons thrown onto one page of Mahou no Ichigo. They were deleted in favor of a page on Yuki-Online with appropriately-sized icons and banners, but both layouts ended up with all the graphics bunched up together on one page. It looked a bit cluttered and rushed, as if it had been quickly thrown together. Also, because the main content area had a set width, I was worried that some of the larger banners wouldn’t fit. I decided to absorb Yuki’s Designs into Yuki-Online because it was another site that, while easy to use, never felt well-organized. Since I wasn’t using it as often as I had thought I would (It was last updated in 2010), it just made sense to move the files to Yuki-Online in fewer pages! While I do really like Yuki’s Designs’ layout, I think that the move was for the best. Shattered-Reality holds lyrics and translations, the KawaTama and Yuki-ON Studios websites, my graphics site, and layout designs. Shattered-Reality began initially as a layout and creative writing site back in 2009. I made the layout and one of my friends, Razz, coded it. Unfortunately it was just too much for me to deal with at the time, and even though I made more layouts and wanted to put them on the website, just seeing the homepage made me want to turn tail…so I did. To make matters worse, I had only gotten one layout completed, compressed, uploaded, and added to the site before Mediafire decided to delete all of my files because of inactivity. (I had been gone for a week and that’s when MF sent me all the emails telling me to sign in to prevent the deletion.) After that happened, I stopped adding content to S-R and it fell into disuse while I moved on to other things like Yuki-Online. I made its brand-new layout in 2011 with the intention of reviving the old site and making new layouts free for download again. However, the realization of having over ten websites and blogs to maintain actively at once hit me like a ton of bricks and I left pretty much all of my sites alone for a while, choosing to only update my blog. After coming back from China (end of May-beginning of July 2011) I hit the ground running with a much better idea of what I needed to do and how I should manage my time, but I still didn’t do much with my websites. While on our yearly Florida vacation, though, I developed a plan: consolidate everything and make it more streamlined and easier to use! I completed coding Shattered-Reality’s version 2.2 layout using HTML5 and CSS3. Frankly, I decided to delete Shattered-Reality because I wasn’t using it! It’s much easier to keep translations on my blog, and layouts can be placed here instead. Why spread myself over so many sites that I can’t keep up with them? There isn’t a good reason! So, saving the layout and the name, the site was scrapped. 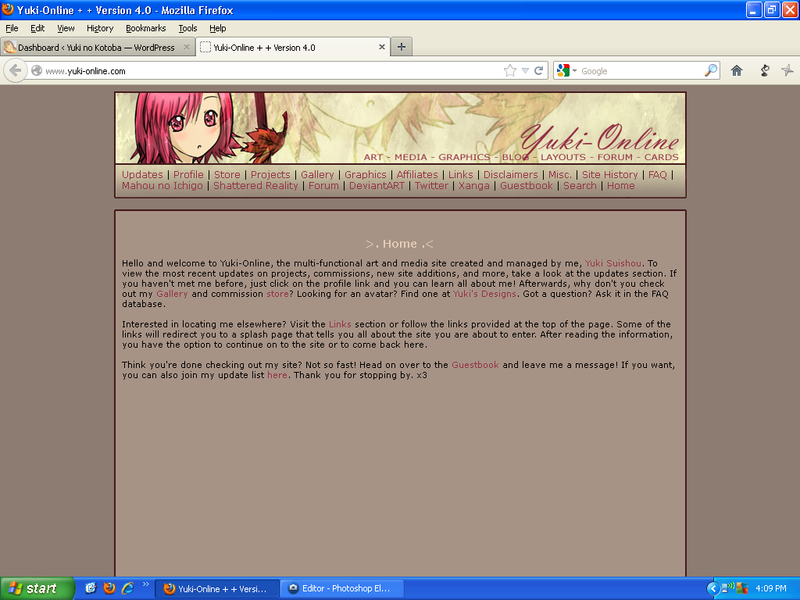 What remains is Yuki-Online! I moved to WordPress because I realized that making layouts is not my passion and it’s a lot easier to use! Even though this is the only personal website I maintain, I’m certainly active on other places! Check out my About page to see them.